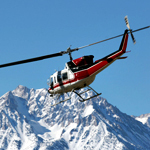 A minute ago, if someone told you that hot chocolate service via helicopter existed, you’d be all mad at them for lying to you. But if someone told you the same thing after reading this, you’d be like, “I know.” Anyway, crazy hot chocolates. Here they come. What it is: Piping-hot cocoa served with cinnamon sticks, ground cardamom and shaved vanilla bean. Where you’ll drink it: In Vermont. Where this resort is. Oh, and thanks to their liberal we’ll-bring-it-wherever-you-want policy, a mountaintop sounds fitting. We assume that’s why they have snowmobiles. What it is: A request-only hot chocolate buffet hand-delivered to your room at the St. Regis Deer Valley by your very own, honest-to-goodness hot chocolate butler. Think chocolate pastilles, marshmallows, Baileys, amaretto and a pitcher of steamed milk. Where you’ll drink it: In bed. Wearing chocolate-resistant pajamas. What it is: An amalgam of Trudelia chocolate, fluffy whipped cream, chocolate chips, housemade marshmallows and amaretto. 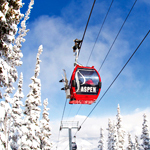 Where you’ll drink it: On Aspen’s Silver Queen gondola. Because, turns out, your ski concierge would be happy to bring the whole thing out there. It’s gondola-ing, not barbarism. What it is: Chipotle-spiced hot chocolate laced with tequila and Grand Marnier–infused whipped cream. Where you’ll drink it: Somewhere within the Amangani resort in Jackson, Wyoming. But considering they too will deliver it anywhere, the giant hot tub overlooking the Tetons sounds about right. Well, it doesn’t sound wrong, anyway. 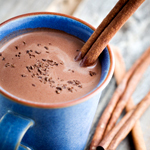 What it is: Mexican Mocha, a potent brew of coffee, chocolate and chili powder. Where you’ll drink it: 9,000 feet up in the Bugaboos. Whenever you need a break, look for the parked helicopter. 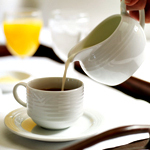 It’s there for the sole purpose of serving you hot chocolate and lunch. Classic helicopter move.